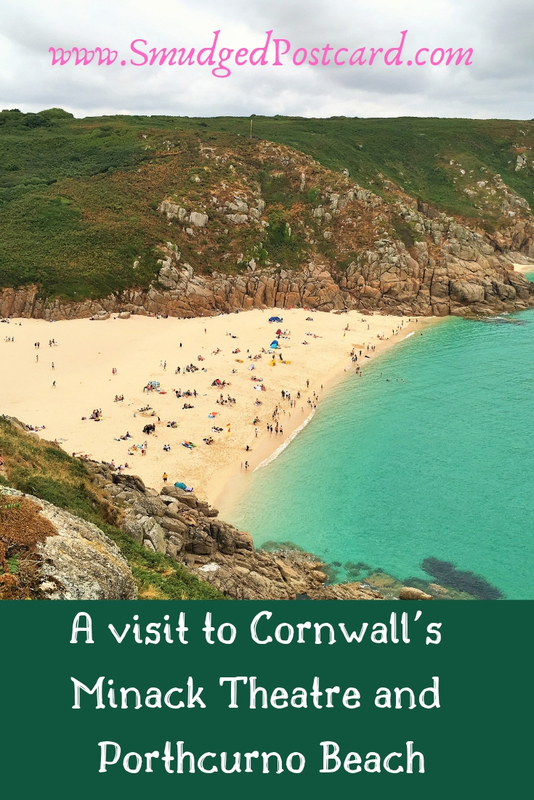 The Minack Theatre and the nearby beach of Porthcurno are tucked away at the very edge of south west Cornwall, just four miles from Land’s End. I’d read about the Minack Theatre countless times so despite it being an hour’s drive from our holiday house on the Lizard Peninsula, I persuaded the rest of the family that they should leap out of bed bright and early on the second day of our summer holiday and hotfoot it down to the furthest reaches of Cornwall. 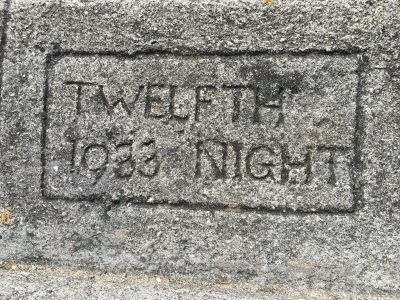 After a successful outdoor production of Midsummer Night’s Dream in 1929, the hunt was on in south west Cornwall for a suitable open air venue to show the Tempest. Well, it’s obviously really isn’t it, where better than a granite clifftop theatre overlooking the Atlantic Ocean? 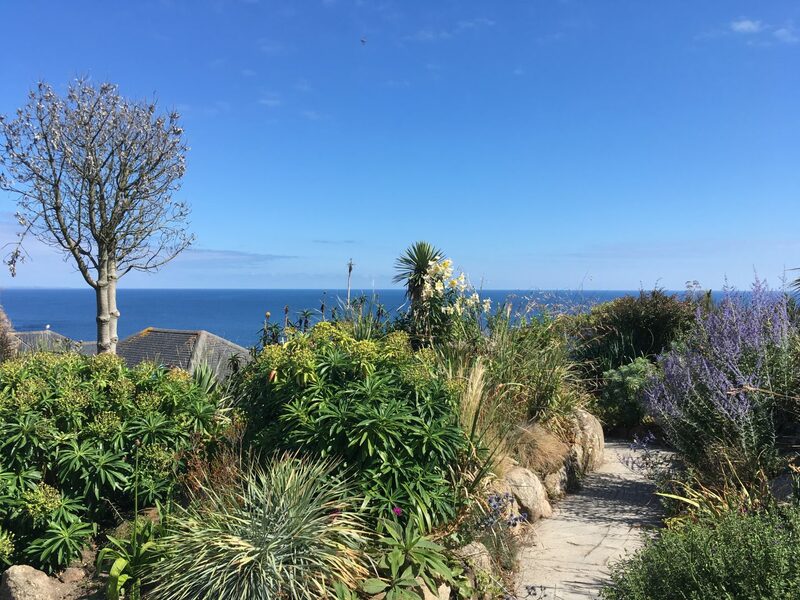 So that’s exactly where a 38 year old Rowena Cade, along with her gardener Billy Rawlings started to build the Minack Theatre during the winter of 1931. 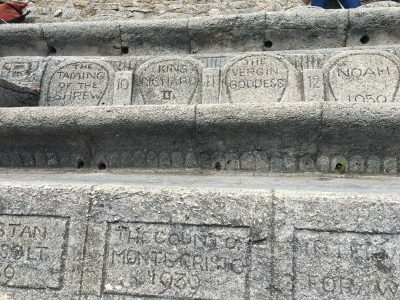 The theatre was expanded upon each winter throughout Rowena’s lifetime (she lived to be 89), with hand carved concrete seating, steps and paths all created using sand from nearby Porthcurno Beach. Performers would use Rowena’s home, Minack House, as their dressing room and a pillbox installed during the second world war was used as the box office up until 1998. More recently toilets, a cafe and a small museum have been built and the theatre is now in the hands of a charitable trust. 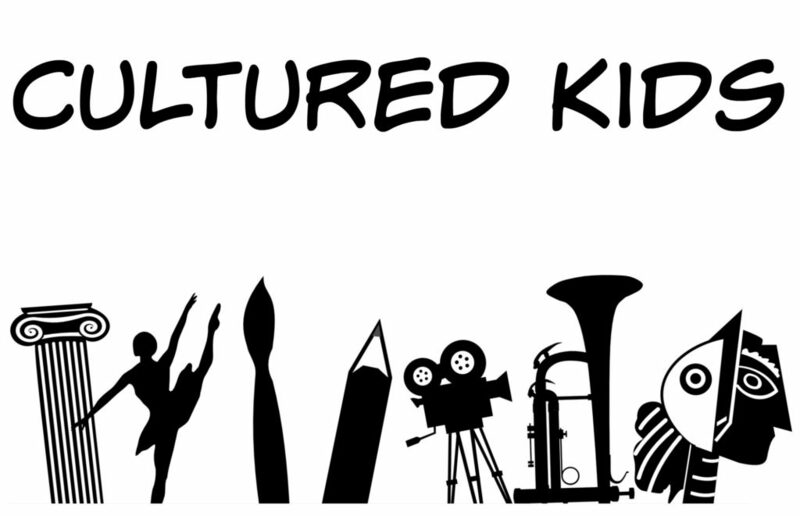 Today the theatre, which welcomes some 110,000 spectators, has a wide range of productions, from evening performances of Shakespeare to daytime storytelling events for children. The 2019 season includes productions of Romeo and Juliet, Sister Act and the Wind in the Willows among many others. When shows are not taking place, over 170,000 visitors come to learn about the history of the theatre in the exhibition centre, or they enjoy exploring the lush gardens or maybe simply stop for a cream tea in the cafe. We booked our tickets online, about a month before our July visit. The tickets were really good value, just £5 per adult and a mere 50p per child (our kids were six and four when we visited). We saw Tales from the Trees by Craig Johnson, a local Cornishman who goes by the name of Squashbox Theatre. I do think it’s a tricky business managing to successfully entertain children and adults in equal measure, however Craig is without doubt an expert in this field. He used his accordion and a range of puppets (we loved Cheeky McNutface the squirrel) to tell the story of forest rangers and their furry friends with great humour and with a gentle nudge towards environmental concerns. Although he hails from Cornwall, you’ll find Craig’s shows all over the UK so do look him up. 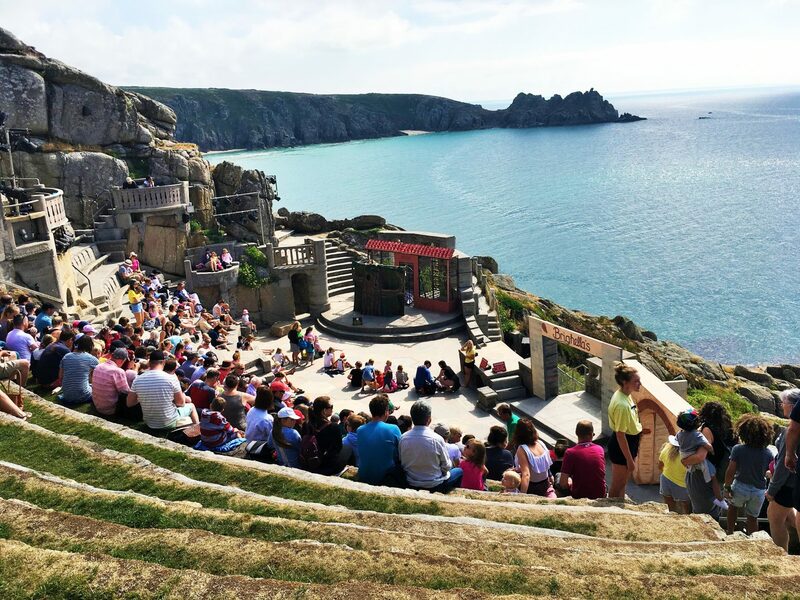 We visited the Minack Theatre on a particularly beautiful summer’s day. It was so hot that we were slapping on the sun cream at 10am as I could feel my legs starting to burn even at that time of the morning. 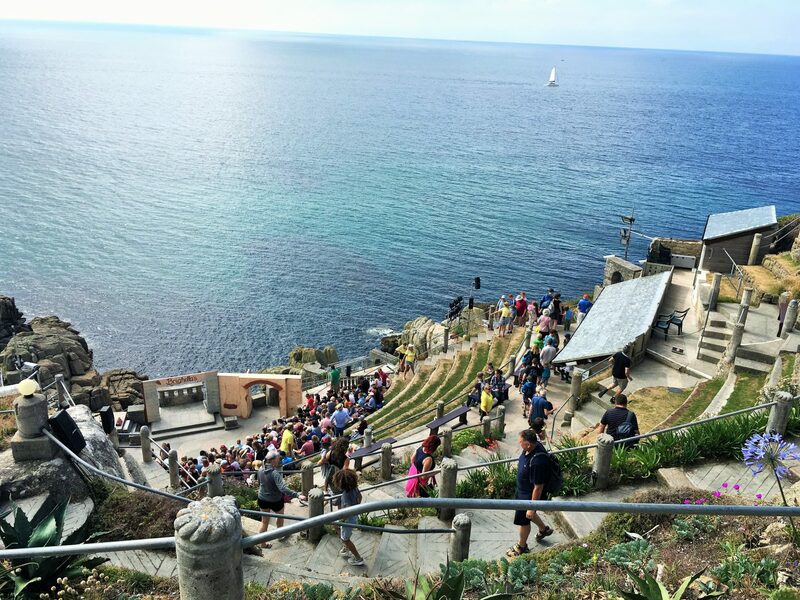 You can’t pre-book specific seats at the Minack Theatre but the stepped seating is so steep that you’re pretty much guaranteed a view wherever you sit. For our performance, children were invited to sit right on the stage area to get a particularly good view of the action. We arrived with only 10 minutes to spare so we were quite high up but this afforded us impressive views over the coast below. Whilst waiting for the performance to start, we were entertained by a wild warm up act in the sparkling waters below us: a pod of dolphins gliding across the ocean. It was so memorising that Craig delayed the start of his show as he realised his audience were a little distracted. 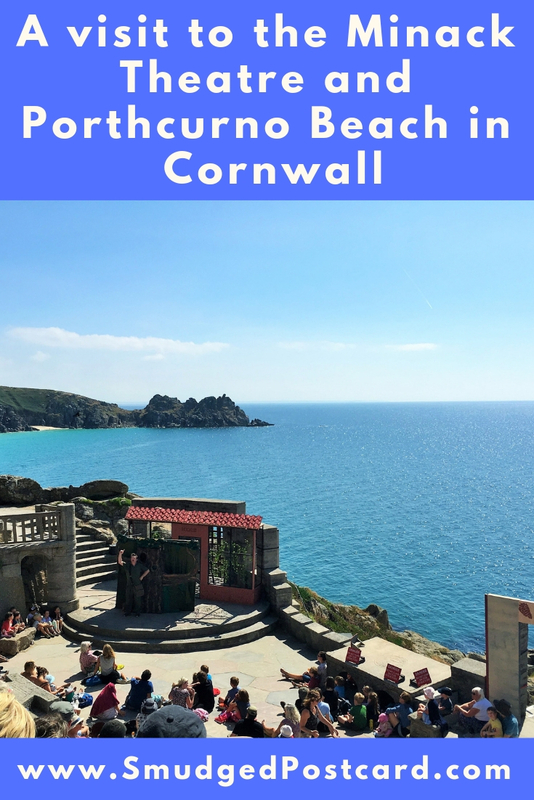 It’s worth seeing Porthcurno Beach from the elevated position of the Minack Theatre, particularly on a blue sky day when the sea is a magnificent shade of turquoise (unfortunately by the time I took some of my photos, the sky had clouded over). 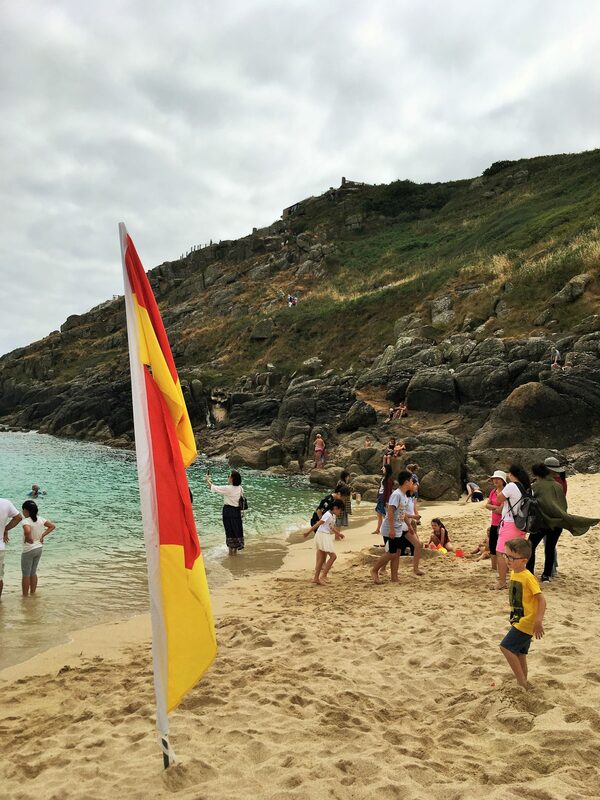 The National Trust-managed beach was packed when we visited towards the end of July and unlike other beaches we visited in Cornwall, it had quite an international feel with people from all over the world enjoying a day at the seaside. 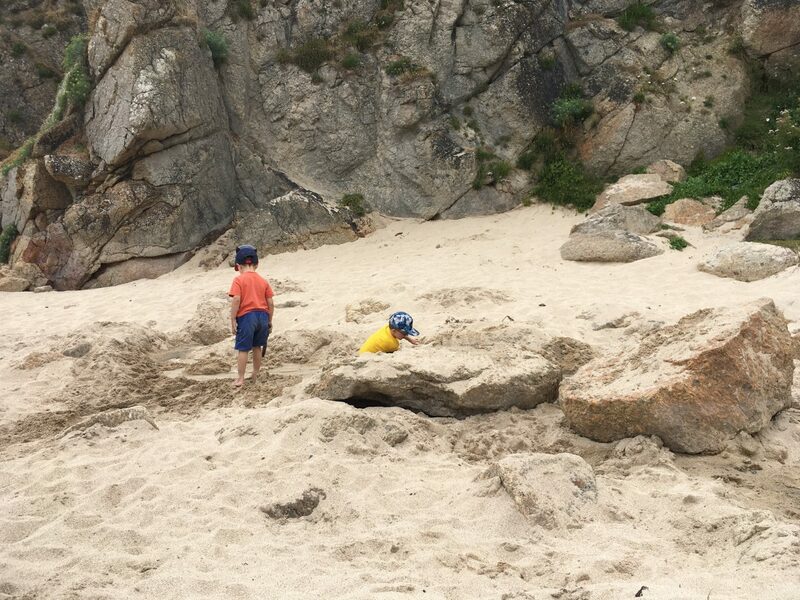 Our boys quickly discovered the little stream which trickles through rocks onto the beach. They remained at the stream with several other children damming, re-routing and generally occupying themselves so completely that the mighty Atlantic Ocean was completely neglected. However, when we visited it was towards high tide and there was quite a strong current so I’m not sure my boys would have fared too well had they tried to go for a swim. If you’re not a fan of the beach, there are lovely clifftop walks along this stretch of coastline, the South West Coast Path website has further information. I’d liked to have visited the Telegraph Museum at Porthcurno, an important wartime communications hub. However, the weather was so perfect that we couldn’t bear to be indoors. 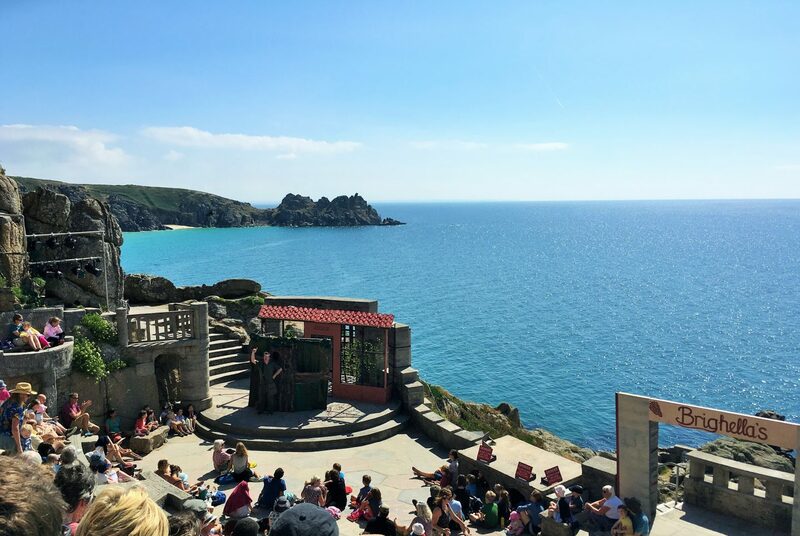 The season at the Minack Theatre runs from April to October but the theatre is open to visitors year-round for a charge of £5 for adults, £2.50 for children aged up to 15 and 50p for the under 11s (under 2s are free). There is a free car park for theatre visitors. There is no shade in the theatre or the car park. Ensure you bring sun cream! It’s important to follow the driving instructions suggested on the Theatre’s website to avoid traffic jams on the country lanes during the summer. The narrow road from Porthcurno up to the theatre does get rather busy with coaches so if you’re only wandering up to have a look at the theatre it’s worth using the cliff steps and leaving your car at the council-run pay and display car park next to the beach. Both the Theatre and beach have a car park, toilets and cafe. The theatre has a small wheelchair accessible area but mostly it is stepped. Pushchairs are not permitted as there is not enough space. 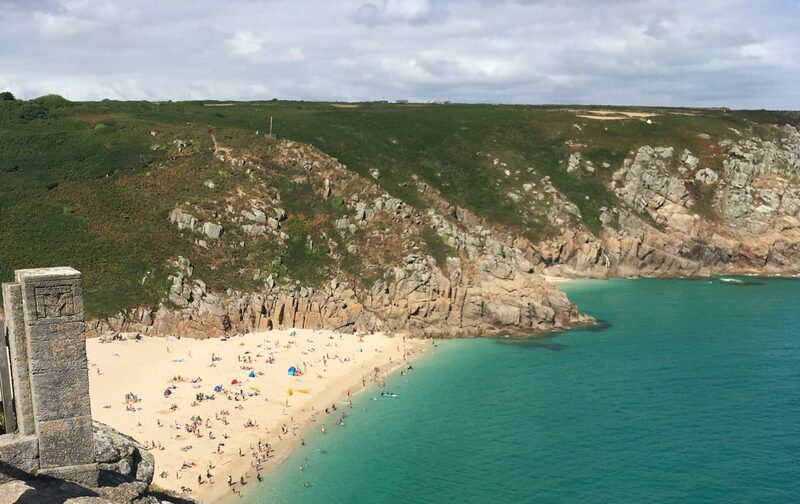 Have you visited the Minack Theatre or Porthcurno Beach? Let me know in the comments below. Wow, boiling hot temperatures and a pod of dolphins – sounds absolutely idyllic! 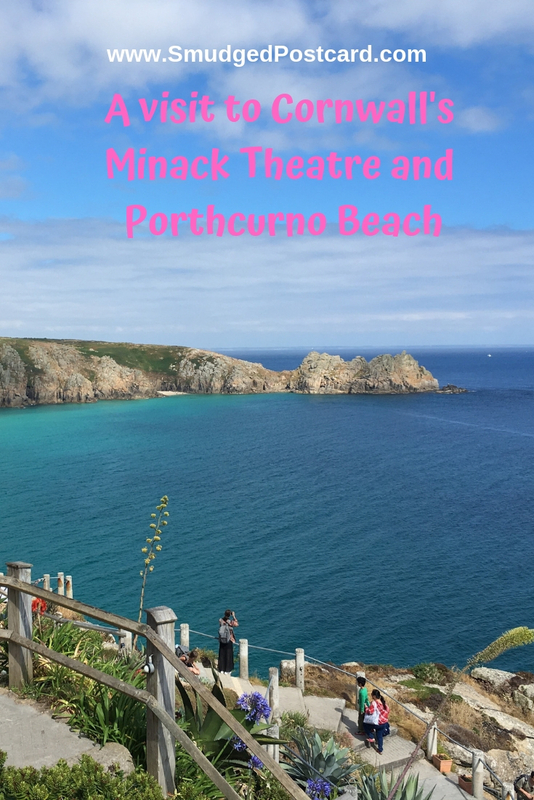 I love the Minack Theatre, such a beautiful spot and your photos are gorgeous. We were so lucky with the weather, not sure I’ll ever be able to take the kids back to Cornwall in case it isn’t that perfect next time! It’s really incredible and utterly brilliant that it was conceived by just two people during wintertime! 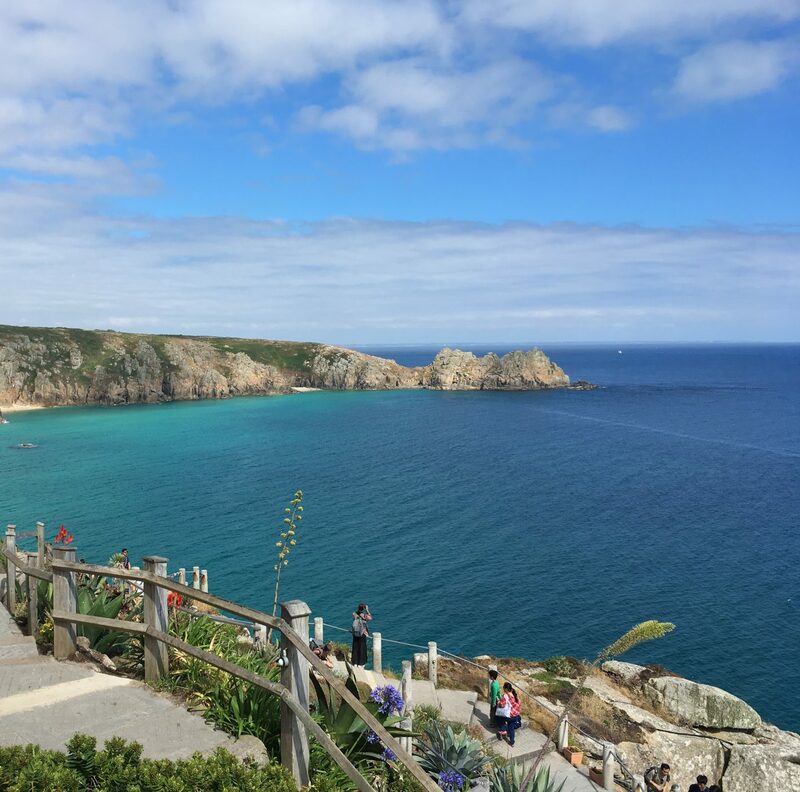 There’s something incredibly romantic about the fact that you’re exposed to the elements at the Minack. With the sea stretching out in front of you, and a blistering hot sun even at 10am, it must have been marvellous. It was, I was so proud of my little country that day! It was so lovely, it really did live up to expectations! It’s funny how we often don’t get round to doing things right on our doorstep! Definitely go, it was lovely. Yes, romantic it is. Before booking, I’d imagined it was the kind of place where tickets would be sold out months in advance as it sounded so wonderful but it was all surprisingly easy. I’ll have to visit the museum next time. The weather was so great we couldn’t bear to be inside! It’s brilliant, definitely worth battling the school holiday traffic! 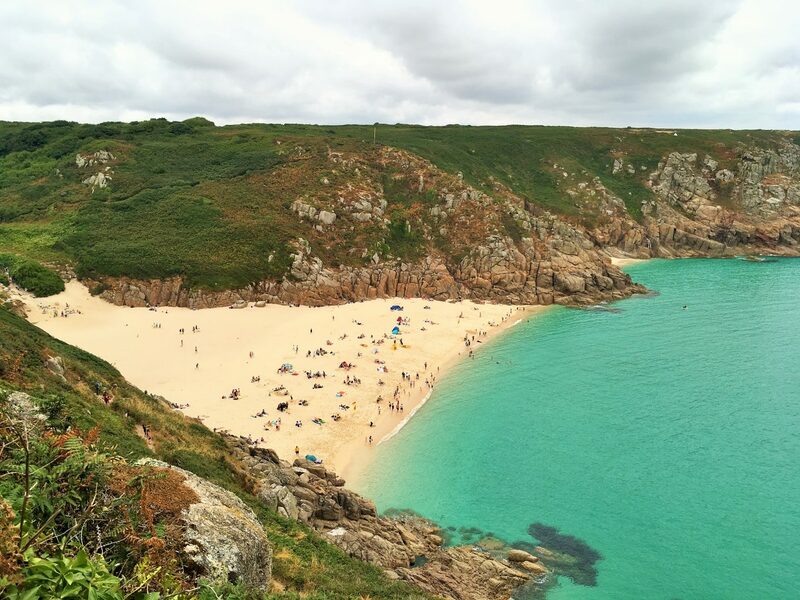 I love Cornwall but I still haven’t been to the Minack – it’s been on the list for ages. Brilliant to have some extra dolphin entertainers too!